What kind of world would we have if people simply centered their thoughts and actions on doing the right thing—for themselves, others, and our planet? How would each of these entities benefit, both personally and mutually? 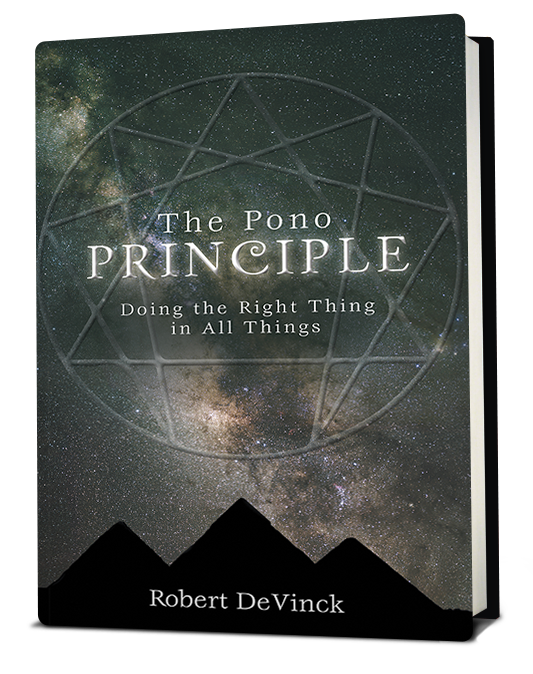 In The Pono Principle, author Robert DeVinck offers some basic, easy-to-follow steps on how to better our world by asking ourselves one simple question in our daily decision-making process: “What is the next right thing I could be doing?” By introducing readers to the Hawaiian principle of Pono (the practice of doing the right thing in all things), DeVinck illustrates how this sacred practice goes to the core of Hawaiian culture and the spirit of aloha. As a resident of Maui, the author has studied how the principle of Pono has profoundly influenced and become central to his own life. What he has learned is that actions done for the common good prove to be far more rewarding than actions taken solely for personal gain. When that truth becomes apparent to a person, his or her life is changed forever. By practicing The Pono Principle, the same result awaits you, those whose lives you touch, and the world that we share in common.